For many people, the disappearance of MH370 is utterly incomprehensible, and you can hardly blame them for thinking that way. After all, we're living in an era of GPS and Google Maps, and basically everyone is being spied on by the NSA. So how can a plane so huge vanish into thin air just like that? Ever since the start of the industrial revolution, humans have been creating countless wonders: building bridges; cars; airplanes; trains; guns and firearms; and two centuries later we basically have had the entire world under our feet. We have looked beyond our planet, snapping photos of the Sun, Mercury, and celestial body as far as Jupiter and the 67 moons that surround it. We have transformed the Earth according to our needs, creating dams and canals, altering terrain and destroying nature at will while pushing other species towards extinction. We have also expanded our clout onto a neighboring planet via the Curiosity rover. Hence, with this constant influx of the glory of our technology it's easy to think that everything is within our control, and that everything can be achieved by our technology. The disappearance of Flight MH370 makes clear that no, ubiquitous though they are, our technologies are not as powerful as you think. As a research student working on nano-sized material, I have seen for myself the limitations of the atomic force microscope (AFM), field emission scanning electron microscope (FESEM) and other supposedly glamorous piece of equipment, and how they could easily be affected by the simplest of parameter and thus often fail to deliver the desired results. Similarly, a lot of our every day items are not as reliable as they seem. Have you ever experienced limited connectivity on your phone? Have you ever questioned why do radios lost their signals when passing through a tunnel? Have you ever asked why can't anyone predict tsunami or earthquake accurately? Or perhaps something more trivial: why do we have to constantly make sure that our tyres are properly inflated? Is there no technology to make sure that our tyres will never go deflated? The aviation industry is supposed to be at the forefront of technology. It, after all, deals with human lives, hundreds at a time. It is therefore very important for aircraft manufacturers to install cutting edge technologies on their planes. The most rudimentary of all equipment in the aviation industry is the radar. But a radar cannot track the identity of an unknown flying object; all it does is just detecting the presence of an unknown flying object, and the task of identifying the object goes to the transponder. So when the transponder on an airplane got switched off there is no way to know the identity of the object. And radar signals, while efficient at picking up objects via the deflection of electromagnetic wave, can also be horribly inefficient. Most radars have a range of only 200 miles, and some can be affected by rain or cloud. If a plane travels at the fringe of radar transmission range, the signals can become spotty due to wave attenuation. The transponder is even worse; they rely on ground-based radar and are basically useless beyond 80-100 km. And then we have the satellite. Airlines routinely use satellites to provide Wi-Fi for passengers. We use satellite in our GPS. It's so common so why aren't anyone using it to find MH370? The question is, which type of satellite should we use? There are many types of satellites: navigation, communication, surveillance, missile detection, etc. In order to scan for plane debris over an ocean, one may need specific type of satellite, just like the fact that we don't put a Hummer in a Formula One race just because both are called vehicle. And to add to our woes, it is extremely difficult if not impossible for a small, developing nation like Malaysia to acquire sensitive surveillance satellite data from powerful nations like China and the United States, which coincidentally are also competitors in expanding their clout beyond their borders. And this reminds me of a question raised by some Facebook trolls regarding the delay of the Malaysian military in releasing its radar information. *refer the footnote of this article. Satellite images are often poor in quality and provide only limited information. Satellites can see a licence plate from space -- if not necessarily read it-- but in the case of MH370, struggle to find a 64-meter jet. The Chinese announced last week that their satellite had picked up objects believing to have belonged to MH370 in the South China Sea, but follow-up investigation showed that it was a mistake. Similarly, Australian Prime Minister Tony Abbott yesterday announced to the world that a satellite detected two floating objects in the southern Indian Ocean, but aircrafts dispatched to the area could not find the object. So how accurate can satellites be? The United States owns almost half of the 1071 operational satellites in orbit around the Earth today, and even they took 10 years to find Osama, who never even wandered far from the Middle East. What about ACARS? It actually functions as a secondary radar on a plane. So if we have two satellites receiving the pings, it is possible to deduce, using some calculation, the approximate location of an aircraft. However, the ACARS doesn't have a constant line of communication with the satellite, making it difficult to verify the exact location of the plane. Then one may ask: if everything is so difficult on board, why don't we stream every information in the cockpit - the pilots' conversation, the cabin pressure, altitude - to the ground instead of the blackbox on board? In fact, the technology needed to stream crucial flight data is already on the market. It costs less than $100,000, only half the price you pay for a brand new Lamborghini Gallardo in the U.S. It acts like a virtual blackbox, the only difference between the two is that a real blackbox is fitted on the plane and the virtual blackbox is fitted on the ground. That way an airline doesn't have to go out searching for the real blackbox in the event of a crash. But most airliners aren't willing to shell out the additional cost to fit their fleet with the technology. 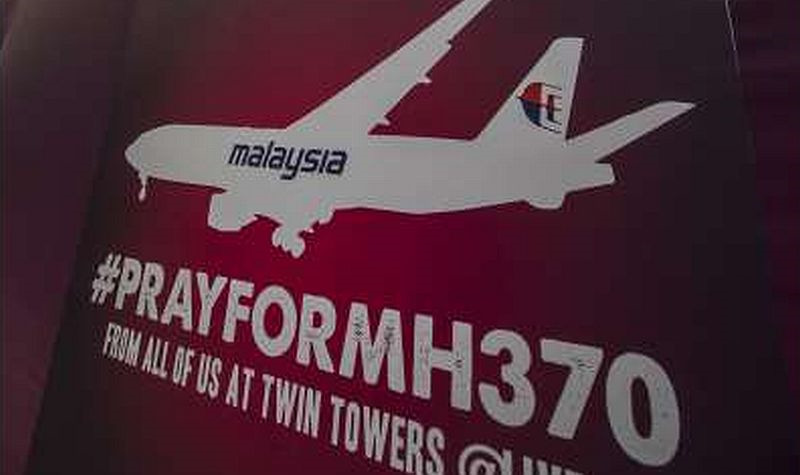 The sad irony is that events like the disappearance of MH370 and Flight 447 are so rare nowadays it's more economical to launch a search and rescue party rather than fitting the entire fleet with the virtual blackbox. The disappearance of MH370 has exposed two of our biggest weaknesses: our constant reliance on technology, and our assumption that technology can always save the day. But the disappearance of MH370 has clearly brought technology down on its knee. The purpose of me writing this is not to condemn any party (I'll leave that at the footnote, perhaps) nor to speculate the outcome of the missing plane, but rather to remind all of us that even with all our technology and the combined endeavor of 26 countries-- including that of the two superpowers of the world-- we can only do so much. 1) Releasing radar information is a matter of national security. An expert can deduce quite a lot from a radar information, the simplest being the signal range and the parameters. If one knows the range of the radar system, it would be easier to derive a way to avoid detection to sneak into our territory. Radar information is therefore considered a highly classified information. You may argue that the MH370 issue is a matter of life and death and that Malaysia should put aside its sovereignty and just share the goddamn data. Well, try tell that to the Americans to do that with their reconnaissance information. Please remember that while you're busy searching for the plane, the rest of the world are still going on with their daily businesses. It's preposterous to think that the whole world should stop caring about their sovereignty and share their sensitive military information with each other and you can invade their water and territory using the excuse of conducting search and rescue. And given the tendency of the Sulu militants in invading our shores in Sabah, I can fully understand the hesitancy displayed by our military in releasing the radar information, though they eventually bowed under pressure and released the information and got excoriated by the entire world in the process. 2) It's truly disheartening to see so many Malaysians criticizing the government based on reports filed by unscrupulous foreign media. Firstly, the primary aim of those media outlets is to sell papers, and sensational reporting means selling more papers, because humans love conspiracy theories. Those media don't care about the accuracy of their report because it doesn't cost a cent to paste a small apology note at the end of the report should anything goes awry. I have already demonstrated via my Taiwanese friends that news reported by Taiwanese media can be highly inaccurate. And even glamorous news channels can take a statement made by Vietnamese or Chinese tabloid indiscriminately and highlight it in their report, thus painting the authorities as incompetent and blase. Of course, admittedly it was sort of a mess in the first few days, but since then the government has gone all out to look for MH370. So why the families of the Chinese passengers still think that the government is not doing anything? Their fury, I believe, is partially fueled by the speculative reports made by obtuse Facebookers and reporters in China and Taiwan who accepts the tabloid information to conveniently put the blame on the government. I may sound like a hard-headed patriot here; no I am not. But I'll give credit where it's due and I hope you'll do the same. How Does Cloud Seeding Work?